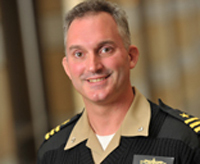 University of Notre Dame government and peace studies alumnus Stephen Fuller ’92 was recently appointed commanding officer of the USS Nicholas, the ship that captured the Somali pirates in spring 2010. He previously was commanding officer of another storied frigate, the USS Hawes, which has been involved in international rescues, counter drug operations, anti-pirate work, and diplomatic missions around the world. Steve grew up on the seacoast of New Hampshire, where he learned to love the ocean and says his heroes included Martin Luther King, Jr. and Mahatma Gandhi. He attended Notre Dame on an ROTC scholarship. As a Navy midshipman and College of Arts and Letters student studying peace at Notre Dame, he cultivated his skills as a bridge between the worlds of the military and peacebuilding. Originally published by Joan Fallon at al.nd.edu on August 16, 2011.